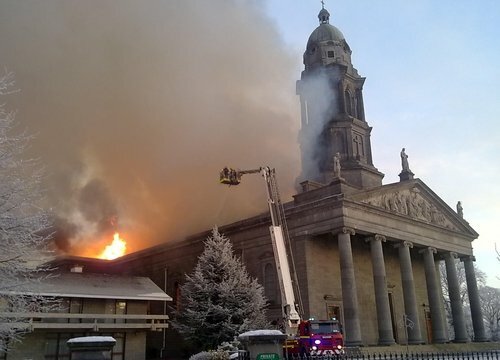 The Bishop of Ardagh and Clonmacnoise, Dr Colm O'Reilly, has said he will restore St Mel's Cathedral in Longford after a devastating fire on Christmas morning caused damage estimated at more than €2 million. Gardai in Longford say that, while an investigation is already under way into the cause of the fire, a full forensic examination of the scene will not be possible until the fire services have made the building safe and handed it over to gardaí. Inspector Joe McLoughlin says that house-to-house inquiries are under way in Longford and gardaí are operating a routine inquiry. Dr O'Reilly said he celebrated midnight mass to a packed Cathedral. He said that it was an extraordinary contrast the next morning. The fire is understood to have started just after 5am on Christmas Day. Construction on St Mel's started in 1840 and it opened in September, 1856.